APPEARANCE: A momonjii is born from a long-lived nobusuma, a yokai which was originally born from a long-lived bat. It is a mysterious yokai which takes the form of a hairy, bestial, old man who wanders the wilds and assaults passersby, particularly crying or misbehaving children. 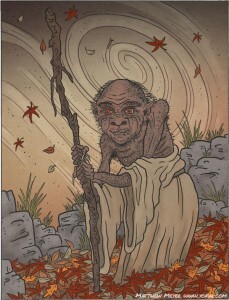 Momonjii appear late at night on the road, when the wind blows strongly, and those who meet them suddenly become very sick. ORIGIN: The name momonjii was created by a very complicated combination of Japanese puns and wordplay. It is formed from the words momonga and gagoji. Momonga is the Japanese word for a small flying squirrel, but long ago the momonga and musasabi (the Japanese giant flying squirrel) were thought to be the same animal, so their names were used interchangeably. The yokai nobusuma (from which momonjii are created) very closely resembles a musasabi, and so the interchangeable name momonga was often used to refer to the nobusuma. 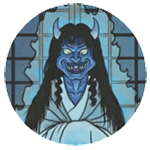 Gagoji is a regional word that refers to a bogeyman-like monster who assaults children. The word comes from the legend of Gagoze, the demon of Gangō-ji; being a regional variation of the demon’s name. Thus, momonga and gagoji were combined to form momonjii, referring to a scary child-assaulting monster which is related to the nobusuma. During the Edo period, there was a strict prohibition on eating meat from certain animals such as deer and boar. These forbidden animals were collectively referred to as momonjii. To get around this prohibition, shops began selling animal meat as “medicine” instead of food. These “medicine” shops were called momonji-ya, and the meat sold there was believed to ward off disease. The fact that this yokai resembles a wild animal and also brings disease is an ironic reference to momonjii and momonji-ya. The “medicine” sold at momonji-ya was given nicknames in order to disguise its true contents. For instance, deer meat was called momiji, or maple leaves, and boar meat was referred to as botan, or peony. This secret imagery persists in things like hanafuda playing cards, where deer and maple leaves, and boar and peonies, are depicted together. When Toriyama Sekien, who was very aware of the imagery in hanafuda cards, first illustrated the momonjii, he drew him hiding in a pile of maple leaves — creating yet another connected between this yokai and the prohibition of animal meat.